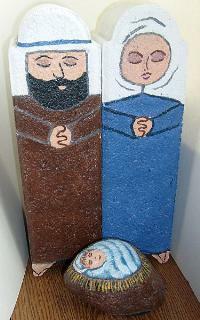 This bright outdoor nativity set painted on garden pavestones is sure to become a conversation piece as visitor's enter your home for the holidays. Mary's robe is painted using bright blue acrylic paint; Joseph's robes are painted with dark brown acrylic paint. Mary's hair peeks out of her white head scarf; Joseph's headdress is white and the headband is blue. Baby Jesus is painted on a large rock; His swaddling clothes are blue and white. Several coats of sealer have been applied to each figure as protection against the outdoor elements. This item is available for pick up in Pueblo, CO only. Due to weight and shape of these pieces, this nativity set is only available for pickup in Pueblo, Colorado. Pickup instructions will be furnished after payment is confirmed.